A powerful and curious film by Werner Herzog based on a mysterious real life incident. Anchor Bay USA R0 boxset + DVD release. In 1828 a young man (Bruno S.) is taken from a castle cell by a mysterious man, and left with a note and a prayer book in the middle of a town. The town's people find him and discover that he has spent his entire life chained to the floor of the cell, never walking, talking or seeing the outside world. A man without any knowledge and a child-like naïvety, he is eventually taken in by a local gentleman who looks after him for two years. Kaspar's past remains a mystery, but there are people who seem to want him dead. Although based around a well documented real incident, as with his other 'historical' films, Herzog takes the basic frame and works his own story around it. The story is that of a man who is essentially 'born' fully grown and the script contains some wonderful references to his naïve and child-like attitude to every day situations. There are elements of comedy and tragedy running throughout the film - much of the comedy comes from Kaspar's ideas, and the attempts of the townspeople to educate him although importantly the film never mocks his situation or plays it up for cheap laughs. The tragedy is very notable towards the start, as the people see him like a circus animal and humiliate Kaspar - some of the scenes are very awkward and hard to sit through. 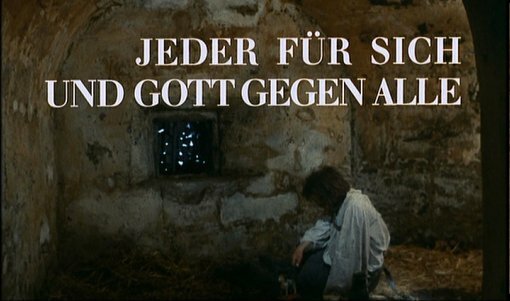 The pacing is very slow and gentle and most of the film is dialogue based, unlike most Kaspar Hauser films it doesn't dwell on his original identity or motives. Herzog's direction is strong here with some clever camera-work - at the start of the film as Kaspar is experiencing the outside world for the first time, the camera will often focus on random, every-day objects that Kaspar is obviously seeing for the first time. Generally, however, Herzog keeps the direction in the background, with some nice long shots that lets the story tell itself. The soundtrack is composed of a mix of well known classical music that fits the film well. While the direction and storyline are solid, the casting proves to be the most controversial and ultimately memorable aspect of the film. The lead actor, known only as Bruno S. was a street musician in Berlin who had spent most of his life in institutions and care homes after being abused by his mother from a young age. Herzog noticed him in a short film about street musicians and decided that he would be perfect casting for the film role. Bruno manages to convey a wonderful naïve innocence in the character, and his performance is one that could easily be considered terrible, but for the part he plays, is completely suitable. He reads every line out loud as though reading from a script, but this is quite plausible for a man who has only learnt language in the previous two years. He similarly has a tendacy to sit completely still and unmoving, despite people talking to him or moving around, something that a man who sat, bound, on the floor of a castle for 16 years might be prone to do. There has been some criticism of the casting of a 40 year old man in a role that (if historically accurate) should be played by a 16 year old, however Werner Herzog has repeatedly pointed out that the film itself is fictional, and that the age of the character is irrelevant to the story that emerges. Ultimately, Bruno is an inspired and unique actor who fits the role perfectly and is mostly responsible for the film's sucess, he would later go on to star in Herzog's Stroszeck (1977). There are some familiar faces in the rest of the cast including Walter Ladengast as Kaspar's mentor, who would appear as Van Helsing in Nosferatu: Phantom der Nacht (1979) and the eccentric little Clemens Scheitz as the town scribe who would appear in several Herzog films including Stroszeck (1977) and Nosferatu: Phantom der Nacht (1979). Herzog's favourite composer, Florian Fricke (of Popul Vuh) makes a brief appearance as a blind pianist. The Enigma of Kaspar Hauser is a highly recommended watch - boasting a clever script and a very strong lead performance. Among Herzog's best films and an interesting place to start to explore his non-Kinski works. This film is not recommended to anyone looking for a documentary style adaptation of the Kaspar Hauser story. Highly recommended to all film fans and certainly for Herzog fans. Good soundtrack? A nice mix of popular classic music. The print quality is decent, although very grainy. Minimal print damage, always watchable. Subtitles English translations of the German audio. These are very clever, and include English representations of the deliberately misspoken/old-style German used at some points in the film. Audio commentary from Herzog and Normal Hill - as usual, full of details. Other regions? Anchor Bay UK DVD includes same features plus remixed 5.1/DTS German audio (although since this film is mostly dialogue based, this will likely have little effect on the viewing). A fascinating story, very well written and boasting a unique and incredible lead performance. Highly recommended. A decent looking print and interesting audio commentary. All text in this review written by Timothy Young - 25th August 2006.